A comprehensive bass technique DVD. 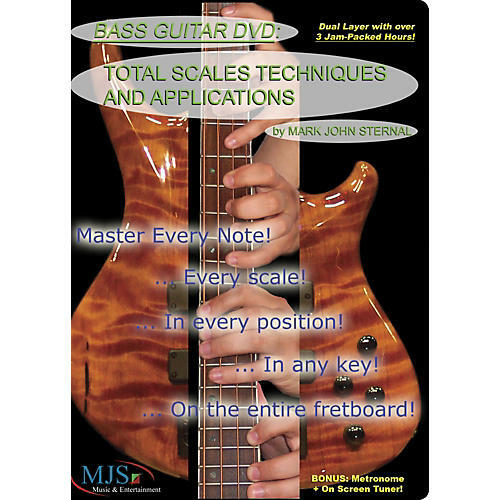 Bass Guitar DVD: Total Scales, Techniques, and Applications from MJS Music Publications teaches you to play bass in every scale, with tricks and techniques in every musical key. You get instruction on playing bass guitar anywhere on the fretboard. Bassist and teacher Mark John Sternal has been credited as one of the greatest music instructors of the 21st century and has taught bass to thousands of bass players and guitarists. This course from Sternal gives beginners pro techniques and makes pros even better. Perfect your bass playing—order this DVD today!